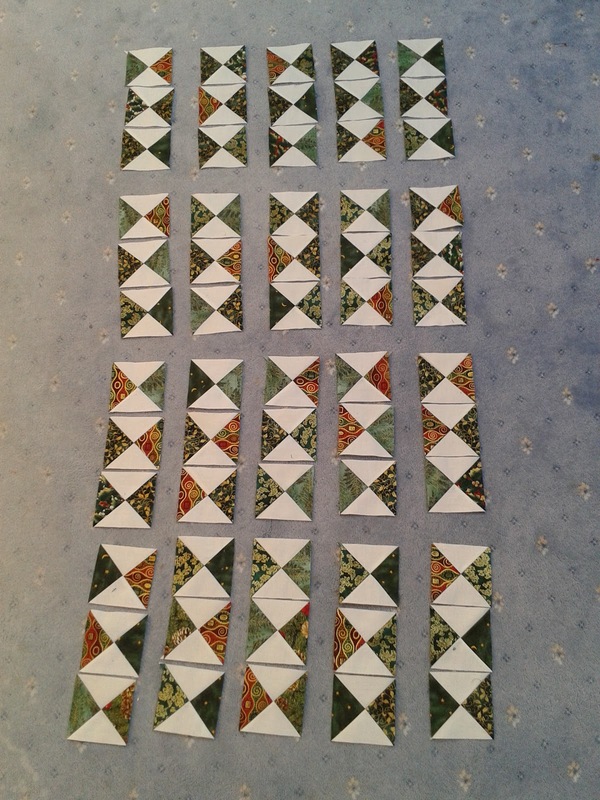 I was doing rather well (if a month behind everybody else) and merrily finished all my quarter square triangles - nice and accurate - singing along to a 'Top of the Pops 1987' cd, and then laid them out in runs of three to sew together into rectangles. Brilliant! But then I started to put them together, and - uh oh - I've had the Points Police round here and no amount of block-wrangling has prevented me from having to wield that unpicker. Why didn't anyone say that this was a bit tricky - you lot all breezily whipped them together last month and very lovely they all look too. I've gone back and checked. I'm finally relatively happy with five strips of three. Relatively. 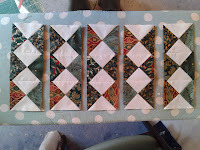 I am rather tempted to crack on with the half square triangles for this month's blocks which will be a great deal easier, and put the QSTs to one side for making into rectangles aside to do another time. So I'm having a run round the world to see how the more practiced of us are getting on. You're so funny! While you're enjoying your gin and tonic, I am enjoying my pop and chips ( potatoe chips! 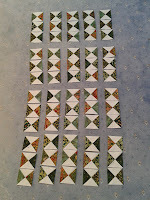 ), and perhaps I should be doing some 'unpicking', but will continue to forge ahead! Your hour glass units look perfect to me! pop & crisps? ;-) You've done a lot today with your Christmas platter of HSTs - how fab do they look! Oh dear! I must say they look great to me, but I know what a perfectionist you are. You know, the more you pick the more you stress the fabric. It's like your Mom telling you to quick picking at a scab or you will make a larger scar. Relax!! It's time to put your feet up, take a sip, and say "I dun' good!" No rule to say you HAVE to do it all tonight, I hope you chose the G&T and a relaxing evening. I think your QST's look brilliant too. After looking at your pictures it all comes back to me. I did have some problems last month which is probably why completing the installment took me three days or so. This month is much easier. 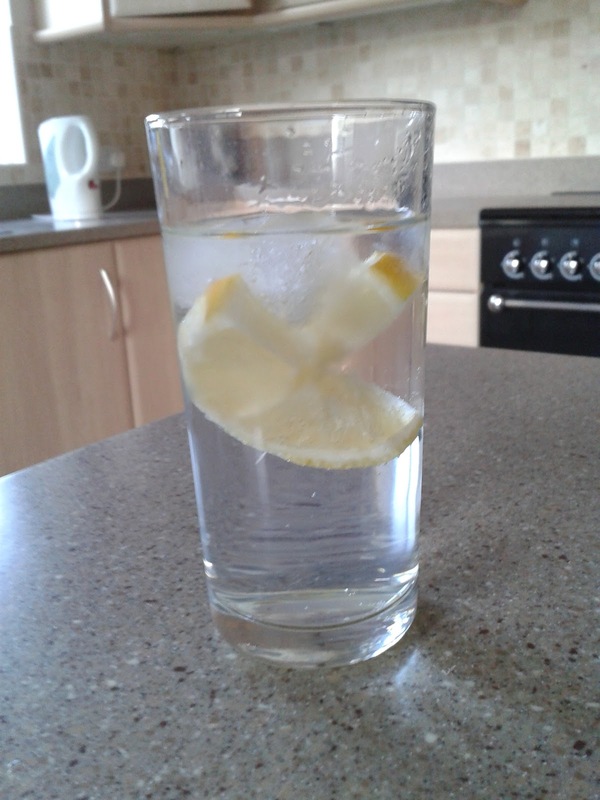 Have the G&T and put it off until the morrow. Well, I have plenty of time to finish these before next QAL day - I think that the step four units will be quicker to make, although there are plenty of them! Oh dear, these wanted to twist on me so do the best you can and say "that's the best I can". The gin and tonic will help and if it doesn't have another. hehe, you'll get there. Now, I'm not altogether sure that encouraging me to swig more gin is a recipe for great point matching...!